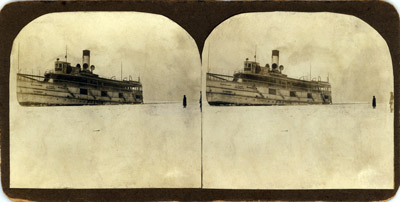 Stereoview of the Cleveland and Port Stanley Navigation Company steamboat LAKESIDE trapped in the ice on Lake Erie. Crew stand by the pilot house, others along the promenade deck and a couple of people stand watching from the ice. The LAKESIDE was launched in 1901 and lengthened in 1905, which dates bracket the likely age of this image.